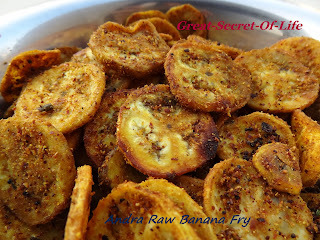 My 2nd son loves Raw Banana Fry however my first one hates it.. So I need to find a day in which the lunch is only for 2nd son. This goes very well with any variety rice. Most of the time I used to do this with sambar powder however sometime ago I was having raw banana poriyal at one of the cousin function. Even though it looked the same but tasted different. But she cannot give me recipe as it was done by some one engaged for the function. I used my own guess and try it out.. It turned out to be pretty good.